Show | Hide all student details. Jump to Grads, 2011 Undergrads, 2010 Undergrads, 2009 Undergrads, or 2008 Undergrads. Aurora set up warming experiments and collected soil samples (in the snow in 2009!). Aurora, a member of the Casper lab, is intrigued by microbial ecology. 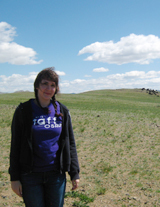 She's pursuing a project that integrates the functional description of the steppe microbial community with warming and grazing effects in partnership with the Earth Microbiome Project. More information about Aurora's research interests can be found at the Casper lab's website. June-July 2008/June-August 2009: Conducted research with PIRE Mongolia collaborator Dr. Alain Plante collecting data on soil C biogeochemistry at Lake Hovsgol. Dan is developing a project investigating the interaction of phenology, pollination, and warming. 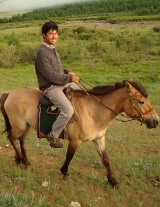 He took his maiden voyage to Mongolia in 2010. 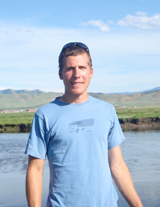 More information about Dan's research interests can be found at the Casper lab's website. "The isolation we experienced in Mongolia served as an amazing refresher from the often hectic society prevalent in the States. The research was awesome, exposing me to numerous different projects and solidifying my interest in ecological studies. My time spent in the Dalbay Valley of northern Mongolia will always have an influence on my studies and future endeavors and I feel blessed to have had this opportunity." 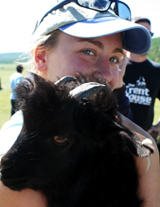 Anna spent a second summer at Hovsgol collecting stigmas from grassland species found within the experimental blocks and mounting them on slides. 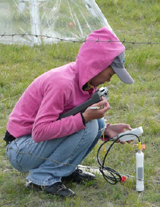 She hopes to use this data to study any potential effects the warming chambers may have on the pollination rates of the plants on the steppe. 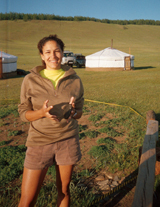 "The horses, the brilliant sunsets, the yak meat, the bonfires, the ground squirrels, the marathon volleyball games, and all those grasses... everything about my experience in Mongolia was fantastic. Let's just say I didn't want to leave. There's something about Mongolia that really makes you feel alive and makes anything seem possible; this past summer is one that will stay with me for the rest of my life." Patrick spent 5 weeks in Mongolia befriending yaks and collecting dung samples to determine rates of nutrient diffusion through soil. "This was an amazing opportunity to experience a whole new culture and environment. It was such a fun and interesting way to spend my summer. The research, the people, and the food are all things I'll never forget." "The PIRE Mongolia project is a tremendous opportunity to get a feel for field research, not to mention Mongolian culture and cuisine, garbombog and gers. (I would avoid wrestling though). Many thanks to NSF and everyone involved." "Learning about an ecosystem while sitting in the grass in the Mongolian steppe taught me more than a lecture ever could. The ongoing projects we were a part of, as well as the independent research I conducted on the grasshoppers of the region, have helped me decide what I want to study after graduation. I have never been to a country so drastically different from the US and especially enjoyed attending the Naadam Festival. 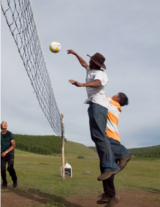 Trying (largely unsuccessfully) to learn Mongolian words and playing volleyball with the Mongolians were some of the best parts of the trip." 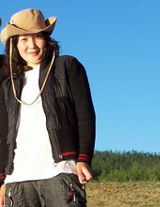 "This opportunity to work on the projcet in Mongolia was an opportunity of a lifetime. The science was interesting, and the cultural experiences were eye-opening. I loved the time I spent in the field working on the project and feel extremely lucky to have had the chance to be a part of it." Austin worked on a project to estimate above ground biomass from leaf area index. "This program is a once in lifetime opportunity, and I highly recommend it to anyone who is interested. The people are great, the research is great, and above all, the food is great." 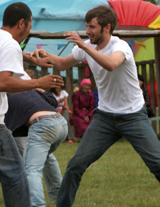 "Going to Mongolia with the PIRE Mongolia project was a really great experience. Not only was it a really relaxing, fun way to spend my summer enjoying nature and experiencing a new culture, but I also learned a lot about research and now have a topic for my senior thesis. I enjoyed my time working with the PIRE Mongolia project so much that I might even have to consider science and research as a career path." "Mongolia is a tad bit different than the United States, and because PIRE Mongolia was my first trip outside of the United States, the contrasts felt pretty drastic. The stronger feeling I had, however, was that the contrasts were refreshing. The landscape was amazing, the people were welcoming and friendly, and I learned an enormous amount about the native culture and ecology. It's an experience I will never forget." Hannah sampled several streams around the Dalbay Valley to look at aquatic invertibrate ecology. 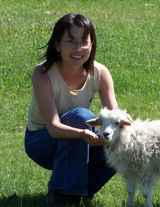 She also assisted Dan Song with his insect survey. Jenna spent four weeks at Lake Hovsgol conducting plant monitoring, helping determine soil depth, and assisting the graduate students with collecting pollinator and soil biogeochemistry data. 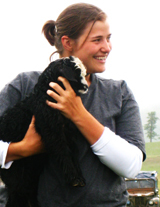 She is developing a thesis focusing on the effects of grazing and warming on plant phenology. 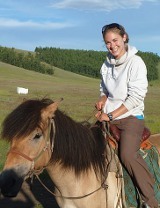 She especially enjoyed horseback riding, playing volleyball, and learning how to count in Mongolian. During the 2010 field season, Michael investigated the composition of the valley's seed bank. Growing seedlings out of 135 soil samples, Michael spent much of his time defending his seedlings from storms, intense heat, and ground squirrel sabotage. Bob is using stable isotopes of carbon and nitrogen to study water use efficiency and the availability of nitrogen in several plant species in order to understand nitrogen dynamics in the plant community. From June-July 2009, Bob collected samples of three plant species at a number of locations near the research site for subsequent chemical analyses at UPenn. Bob graduated with his Masters of Environmental Studies in Environmental Biology in December of 2010. Bob is currently working on environmental guides (1, 2) at FindTheBest.com. Brian spent a second summer at Hövsgöl in 2009, studying the effects of warming inside the OTC's on the timing of flowering in approximately 20 species. 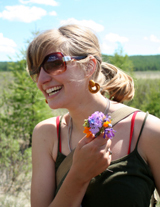 June-July 2009: Julia spent 5 weeks at Lake Hövsgöl investigating the taiga forest and the steppe grassland ecotone. She undertook a study of the how distinct the boundary actually is by counting adult trees and saplings along 24 steppe-forest transect lines and measuring their DBH and nearest-neighbor distance. Dring the 2009 Hövsgöl field season, Kirstin measured heights and DBH of Siberian larches and pines in order to calculate above ground carbon biomass in different parts of the surrounding forest. She hopes to use the data to quantify forest density and carbon sequestration for comparison to results found in other forest ecosystems. June-July 2009: Becky investigated if standing marsh foliage, usually cut for hay during the late summer, interferes with re-growth and if it might prevent permafrost melt by providing insulation. 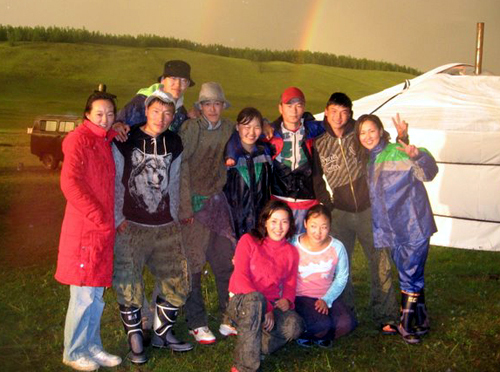 "PIRE Mongolia was the trip of a lifetime. It was my first excursion out of the country and I couldn't have asked for a more diverse and educationally enriching experience! I was able to meet some amazing, intelligent individuals who introduced me to their culture as well as helped to further my knowledge of Mongolian ecology. As a Sociology in Health and Medicine major it was truly eye-opening to see first hand some of the effects that the economy and layout of Mongolia had on its citizens. PIRE allowed me to integrate my passion for biology with my interest in sociology in a way I could never have imagined." Dring the 2008 Hövsgöl field season, Naraa worked on soil moisture, temperature, and carbon flux. 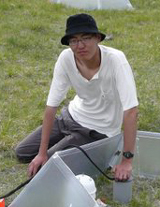 He also aided in soil core sampling along a south-facing slope to north-facing slope transect. Later, he was fascinated by lichen ecology and continued his study on lichen taxanomy and ecology. 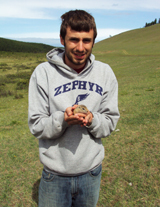 June-July 2008: Dan spent 3 weeks at Lake Hövsgöl identifying steppe plants, collecting baseline data on percentage cover of plant functional groups, and finishing everyone's meals. Dan and Brian created a steppe vegetation photo key for future participants. "Being in Mongolia was unreal. Experiencing the culture first hand, helping world-class researchers, and seeing the majestic landscape are all memories that I won't soon forget. I'm excited to see the amazing research products that will come out of this project in the coming years!" 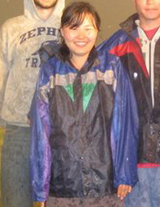 Contributions: June-July 2008: Sarah spent 3 weeks at Lake Hövsgöl constructing OTCs, sieving roots, collecting soil cores, constructing litter decomposition bags, and swimming laps in the 11°C (50°F) lake. 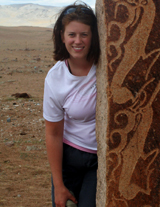 "I feel incredibly lucky to have gotten the opportunity to participate in the PIRE Mongolia project. I had never been to a country more different from the United States than Mongolia, so every experience I had was completely unique, from meeting nomadic herders to washing my clothes in a stream. I loved my time in the field - the experiments were interesting and daily life was challenging, yet rewarding." During the 2008 field season, Azaa primarily worked with Dr. Brent Helliker on the tree-ring isotope project. However, her main interests lie in entomology, so she also spent time collecting Araneae species, to study their taxanomy and ecology. 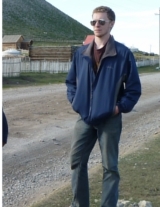 June-July 2008: Brian spent 3 weeks at Lake Hövsgöl identifying steppe plants, collecting baseline data on percentage cover of plant functional groups, and perfecting his wrestling skills. Brian and Dan created a steppe vegetation photo key for future participants. "Our trip to Mongolia was a great opportunity for me. I was able to experience the field aspect of an experiment and interact with people from another culture. Meeting so many new people and working with them on the projects was a lot of fun. 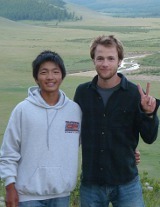 The trip to Mongolia was an unforgettable life experience." Sunjee is interested in plant ecology and wants to pursue a career in that field. Over the 2008 Hövsgöl field season she worked on the open-topped chamber project with Dr. Brenda Casper, identifying plant species and collecting data on plant biomass and percent cover. Although she worked with the "soil group" measuring daily soil moisture, temperature, respiration, and helping to collect soil cores, Lhamaa's interests lie more in entomology, particularly moth taxanomy and behavior. She was able to study moth taxonomy later in the summer of 2008 and would like to continue her studies of moth behavior in the future. She wonders why some moths are just so beautiful. June-July 2008: Annie spent 3 weeks at Lake Hövsgöl constructing OTCs, sieving and washing roots, collecting soil cores, constructing litter decomposition bags, and building fires (sans blowtorch!). Left to right, front row: Azaa, Bolroo. Back row: Lhamaa, Vandka, Naraa, Galaa, Sunjee, Baka, Oko, Sokoo. 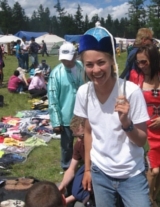 The NUM undergrads spent June-August 2008 at Lake Hovsgol working on the OTC, tree-core, and soil carbon research projects, conducting individual projects, cooking, building beds/benches/etc., playing volleyball, and teaching the Penn undergrads how to wrestle, Mongolia-style.